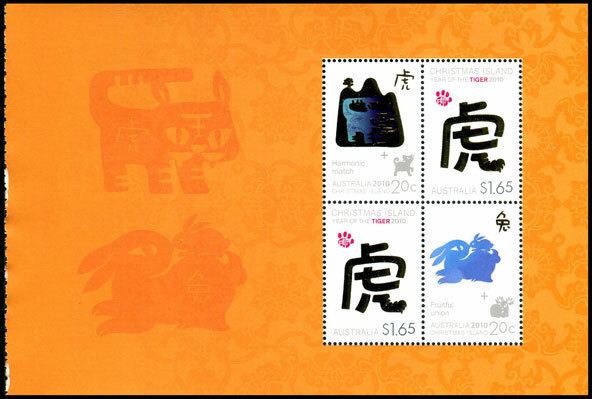 Since 1994, Australia Post has issued an annual Lunar New Year issue. 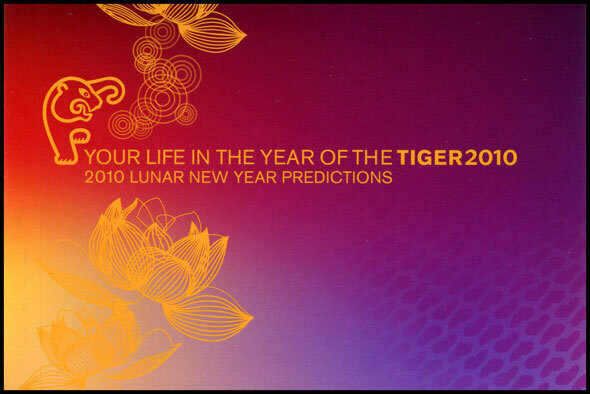 This year is the Year of the Metal Tiger, and runs from 14 February 2010 to 2 February 2011. 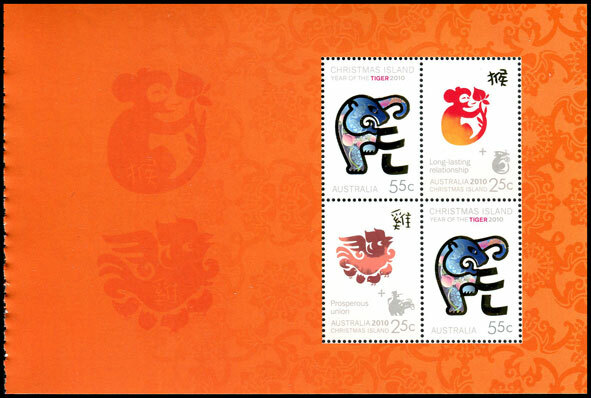 The annual Lunar New Year issue has grown from a pair of stamps and a miniature sheet to, two stamps, a miniature sheet, gutter strips, postage paid envelopes, postcard, a sheetlet, prestige booklet, special event sheet, and for 2010 a circular Zodiac sheet! The 55c and $1.65 values were issued in individual sheets. 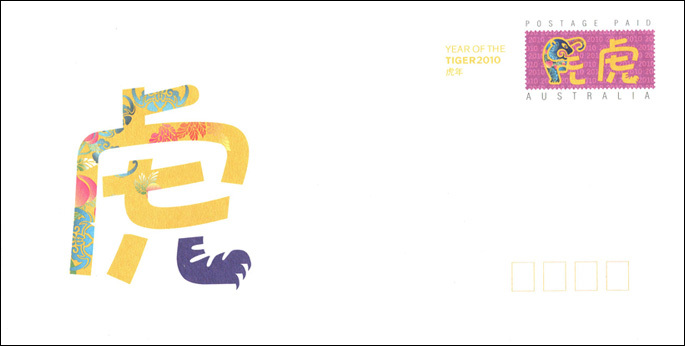 As with past issues, the 55c gutter strip features the twelve animals of the Chinese Zodiac, with the Tiger highlighted in gold. 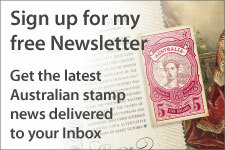 Stamps from the miniature can be identified by the slight colour difference in the value. Both of the sheet values have the face value in grey, while the miniature sheet stamps have the face value in grey-blue. This year's miniature sheet was the same format and size as the last two year's sheets. Again, a sheet of sheet of 14 stamps was issue, and included an 'enlarged' miniature sheet, and a block of 10 make-up stamps (four each of 10c, 20c and 25c). Together a 10c, 20c and 25c add to make the domestic rate of 55c. 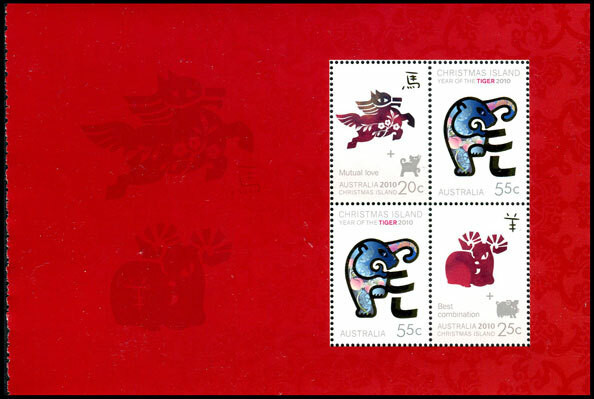 The twelve low value stamps from the gummed Zodiac sheet also appear in the prestige booklet. 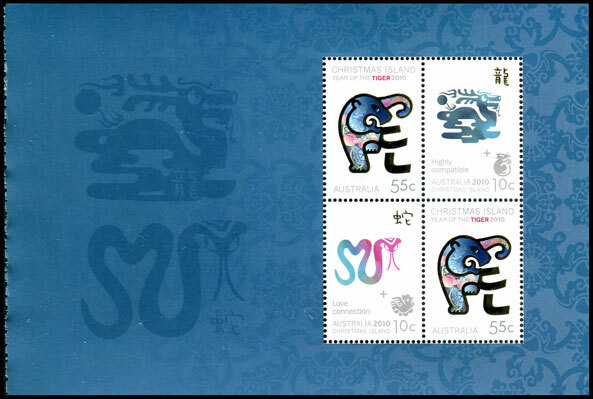 The prestige booklet includes three new stamps. The colour of 'AUSTRALIA' on the $1.65 stamp in the first pane is very different from the sheet and miniature sheet versions. 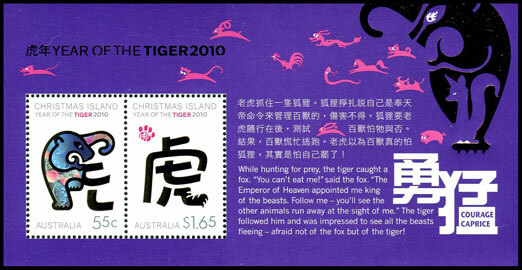 The first pane also includes the Tiger and Rabbit 20c stamps with values in a lighter shade of grey. 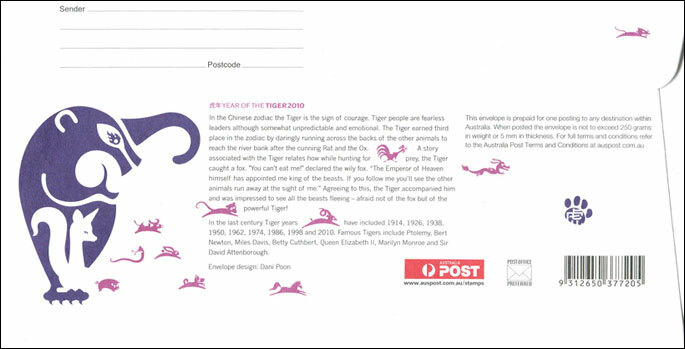 Some of the 55c stamps from the prestige booklet also show the die-stamping slightly misplaced, giving the tiger 'white teeth' and a 'white strip' on its back. The number of these stamps various between booklets - some have none, while my first booklet had six stamps (three panes) effected. The prestige booklet contained six panes of four. Each pane had either two 55c stamps (Panes 2 to 6) or two $1.65 stamps (Pane 1), with the 10c, 20c, and 25c values making up the blocks of four. The above six panes were issued in a prestige booklet. The back of the booklet states the price is $12.95, but the booklet was sold for $13.95. Australia Post has informed me that post offices were instructed on the day of issue to place a price label over the incorrect price. 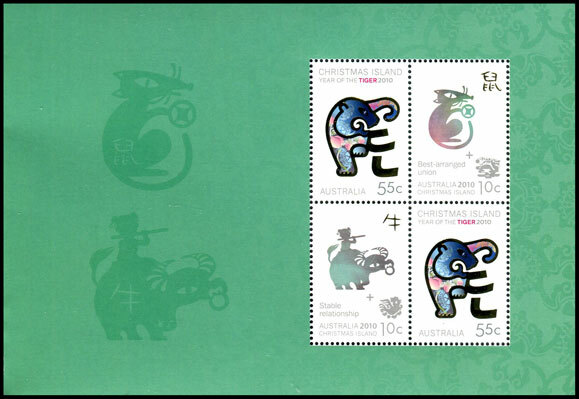 Back in 2007, Australia Post celebrated a complete 12 year cycle with the release of a circular self-adhesive sheet containing thirteen stamps - one for each animal and a circular $1 stamp in the middle. 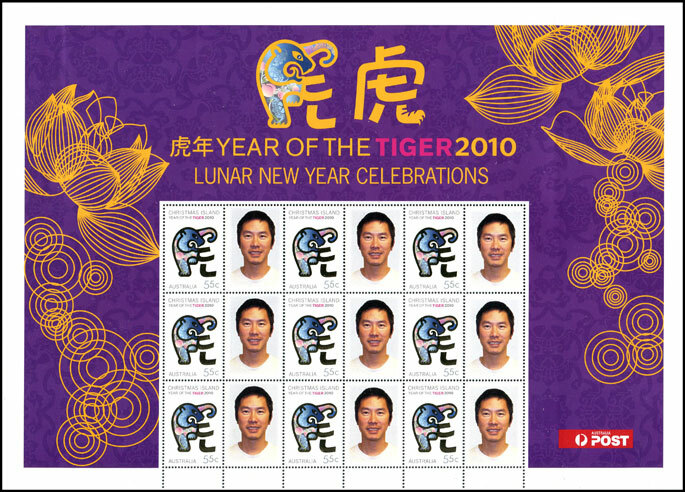 Australia Post will now release a similar sheet every three years, celebrating the past three lunar years. 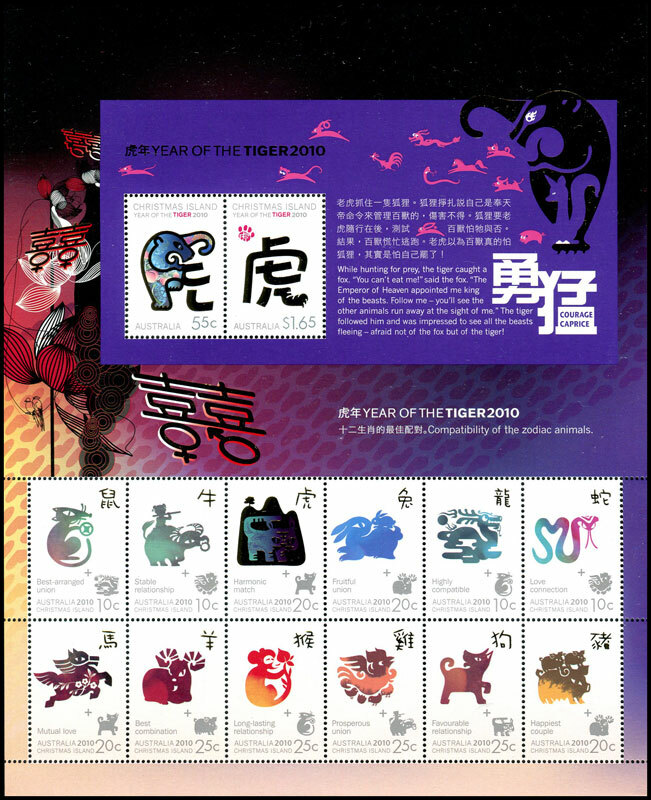 The ten animal stamps (Tiger to Pig) are smaller than the ordinary gummed versions, with the Rat and Ox stamps being reprints of the 2008 50c and 2009 55c stamps. The two reprinted stamps contain a small '2009' microprinted date. 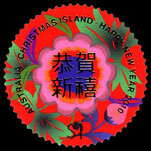 The sheet also includes a $1 circular stamp featuring a flower and Chinese characters. The decision to include these stamps is curious. The 10c, 20c and 25c self-adhesives are the lowest value self-adhesives issued by Australia Post, and are unequal in number. 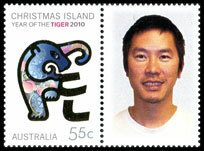 50c is the pre-2008 letter rate, and the $1 does not match any postal rates. The sheet is also sold for $9.95, more than double the $4.40 face value. 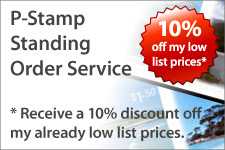 Personally, I would've preferred a sheet of twelve 55c animal stamps and a $1.10 circular stamp (face value $7.70). 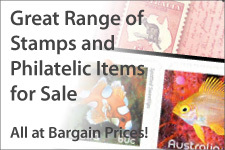 Collectors would have more chance of seeing the stamps postally used, even if it was sold at $9.95. No information is known on the paper used. I have suggested B100 as the backing paper is similar to that used for booklet stamps, and the extra thickness would give the sheet extra strength. 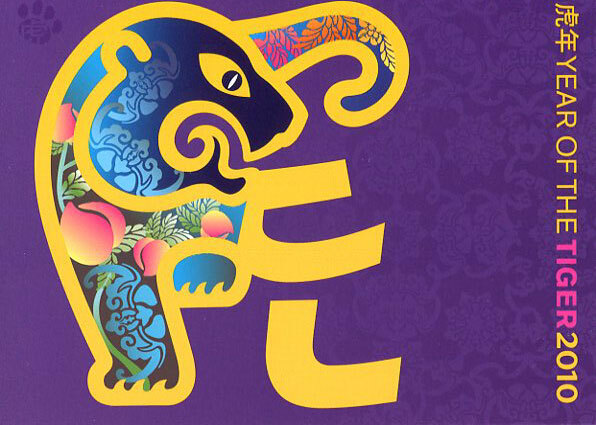 This year the Zodiac sheet was only issued in a folder, and sold for $9.95. 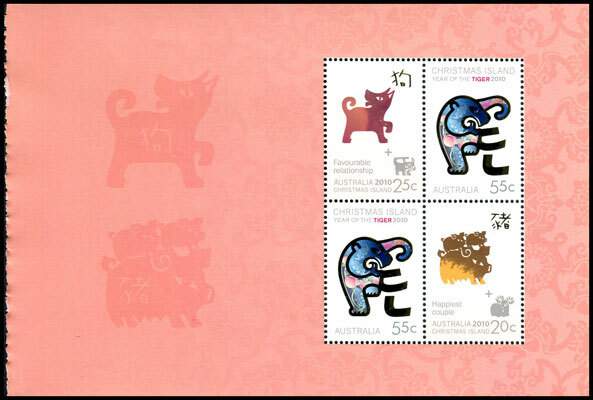 In 2009 Australia Post released the first personalised sheet on Lunar New Year stamps. 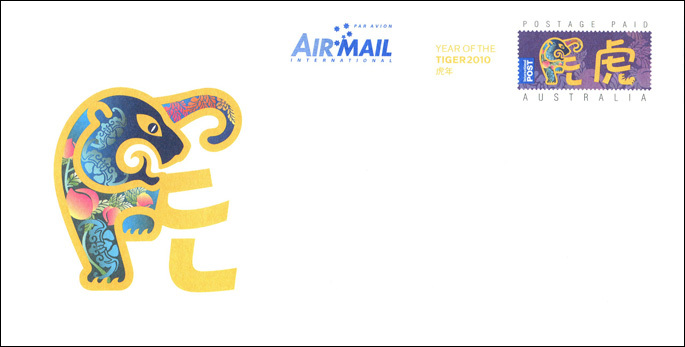 Again, a personalised stamp sheet will be released for the 2010 Lunar New Year Festival in Melbourne, with a generic version available from mail order. 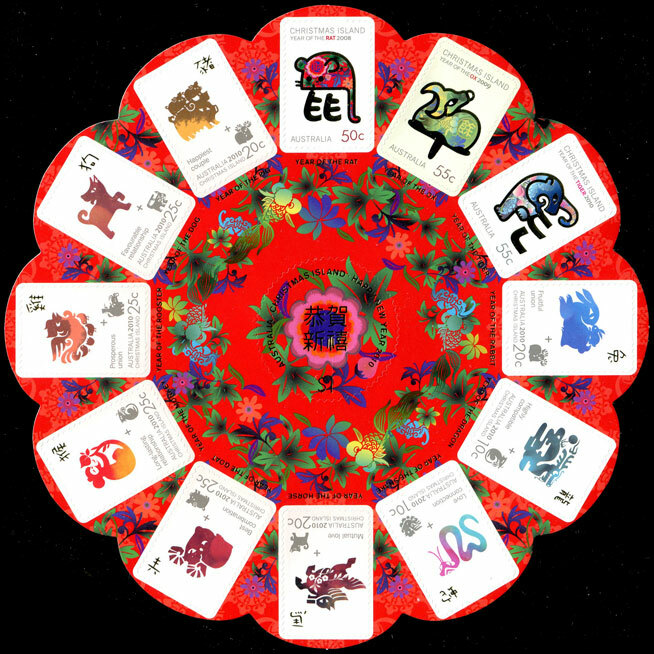 The release date for this sheet is 12 February 2010, the first day of the festival. 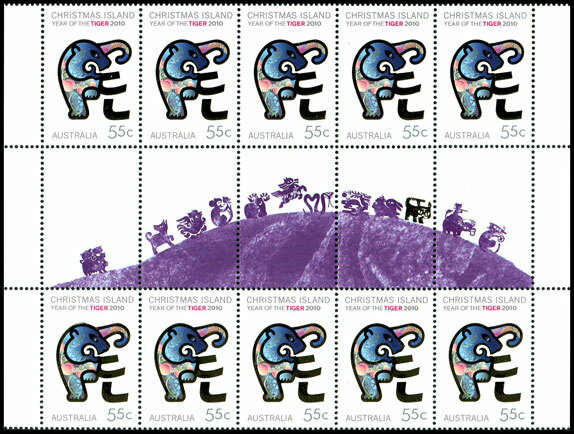 The colour of '55c' on the stamp is a more solid grey, when compared with the sheet stamps. 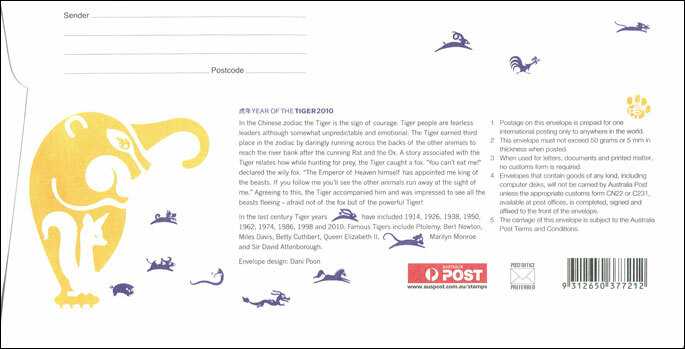 Again, Australia Post released a postcard and two pre-paid envelopes with this issue.